Students from the School of Journalism and Media Studies and Computer Science worked together with faculty to create an innovative mobile news app and website designed to provide campus event information. AzteCast, now available on iTunes and via the web (aztecast.com), provides local news and events on campus by geo-locating information about the event. Users can view, post and share the information. AzteCast was the brainchild of the students enrolled in the interdisciplinary course of JMS 550. 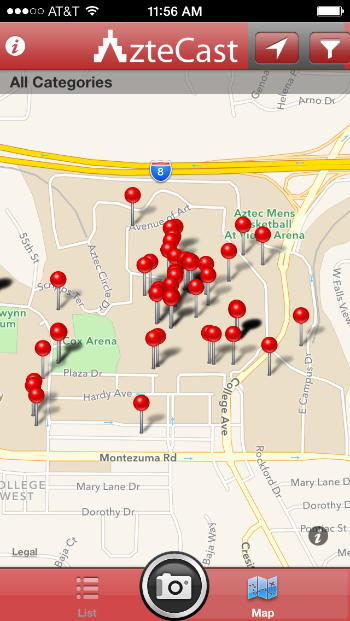 Based on data collected during the semester, which included a survey and several focus groups, the students identified that an event-based mobile news app would be of interest to the SDSU campus community. Assistant professor of journalism Amy Schmitz Weiss, along with computer science professor Joseph Lewis co-taught the course. Using open-source software, Ushahidi, the students worked in teams to design and build the website and app. Ushahidi uses crowd-sourcing technology to visualize and map information. AzteCast was based in part from funding that Schmitz Weiss received. Schmitz Weiss was one of the first ten grant recipients from the John S. and James L. Knight Foundation as part of a collaboration with the Association for Education in Journalism and Mass Communication (AEJMC) designed to inject more innovation into journalism education. AzteCast can be downloaded for free from iTunes, or you can visit the website at aztecast.com.